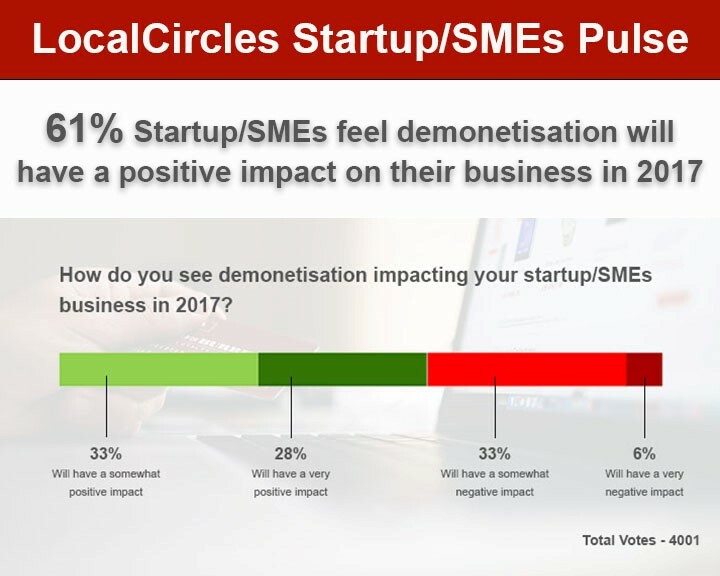 One year of Startup India - What Startups/SMEs want in 2017? January 16, 2017, New Delhi, India: Startup India completes one year today. 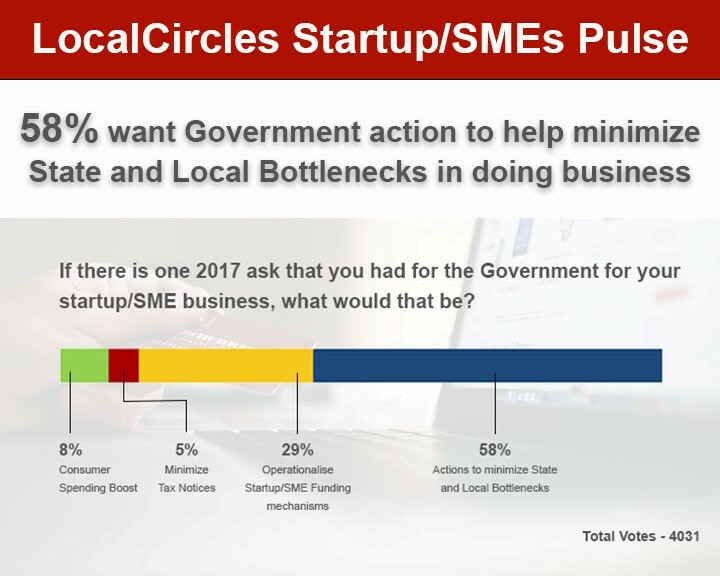 LocalCircles, India’s leading citizen engagement platform has been working with its more than 1.2 million most active citizens of India and among them over 30,000 entrepreneurs and startups to prepare a list of what Startups and SMEs want from Government in 2017. This discussion assumes even more importance as India’s General Budget 2017 is just a few weeks away. In the last one year, significant announcements have been made by the Government on making easier to start up in India. These have included benefits for Startups on various fronts including tax exemptions, exemption from inspections, IPR benefits, faster company registration, new fund for Startups and opening Government business opportunities for Startups. Per Startups and Entrepreneurs though, most of them are unable to realize many of these benefits as they currently only apply to Startups incorporated after April 1, 2016. 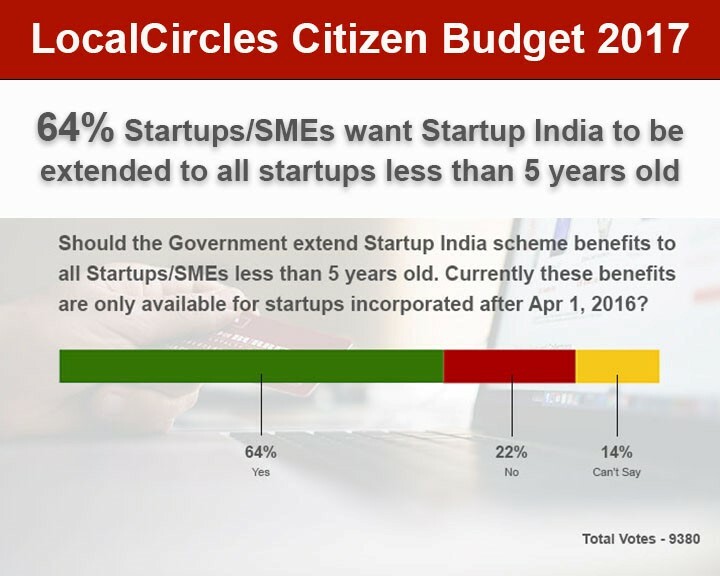 In a LocalCircles Budget poll on Startups, one of the top asks by Startups/SMEs/Citizens is to extend these Startup India benefits to all Startups incorporated in the last 5 years. 64% of the over 9000 respondents voted in favor of this. Startups also want the Government to make qualification of Startup less restrictive and reduce the involvement of incubators and inter-ministerial board as much as possible. In addition to the above, Startups and SMEs feel that they are still commonly subject to tax notices and scrutiny exercises even if they don’t have any income or revenues. Startup valuation is a subject that is not well understood by tax inspectors and leads to unnecessary questioning and harassment. This is something that all startups incorporated in the last 5 years must get automatic exemption from. Given the recent crunch in startup funding, many startups are faced with lower valuations and for many this is triggering tax notices by the income tax department. Some startups have seen tax demands for the assessment years 2013-14 and 2014-15 under Section 56(2)(vii)(b) of the Income-Tax Act, 1961. While the section was actually introduced to curb money laundering, but it is getting wrongly aimed at genuine investment in startups. Another issue that has been raised by many startup entrepreneurs in the last two weeks is that of the newly introduced service tax notification by Central Board of Excise and Customs Circular No. 202/12/2016-Service Tax – (09/11/2016) effective Dec 1, 2016 requiring payment of service tax on IT services procured from overseas. Per the notification, Indian companies procuring IT services from overseas suppliers classified as Foreign OIDAR (online information and database access retrieval) vendors now required to pay service tax on foreign vendor invoices in India, register themselves for service tax and deposit it on behalf of their foreign vendors. For many technology and consumer startups, most of the services procured are from foreign vendors as they are not available in India and this will not only increase the cost of doing business for Indian startups, it will also result in increased regulatory compliances as they will be on the receiving end of any scrutiny notices that are generated as a result of the filings. It also will make India based startups less competitive in a global marketplace as many global tech startups that are headquartered and registered overseas do not have to face this tax liability. This move alone is an incentive for India based tech startups to consider moving outside India. 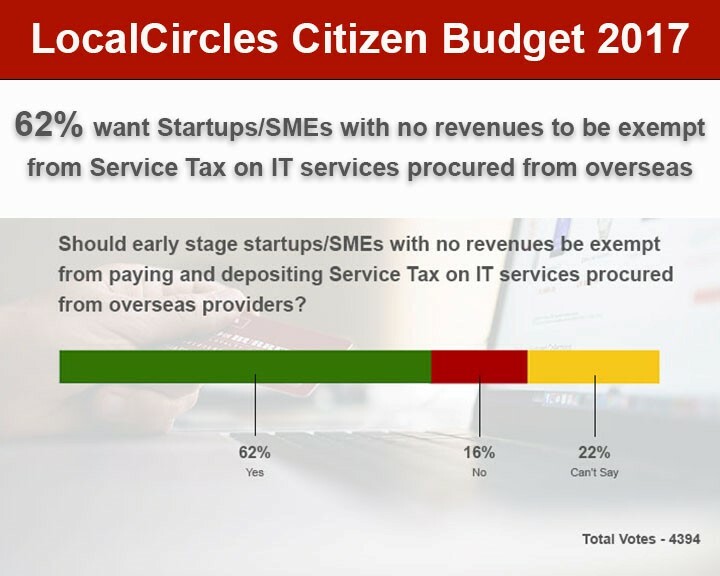 In a poll conducted in the Startup/SME online community, 63% startups, SMEs and citizens suggested that Startups with no revenues must be fully exempt from the Service Tax as they will not get any offset and the tax may further burden them in their seed stage where most startups operate on no or limited funding. 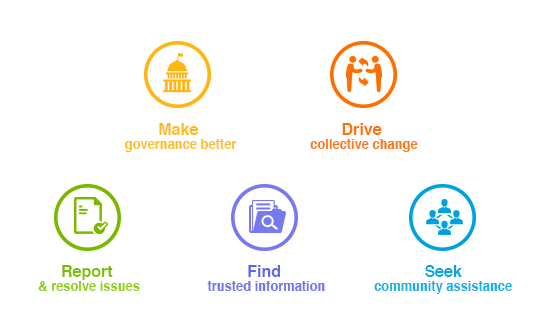 Other issues highlighted by Startups/SMEs include Government support on the ground at state and local levels which is largely non-existent today. 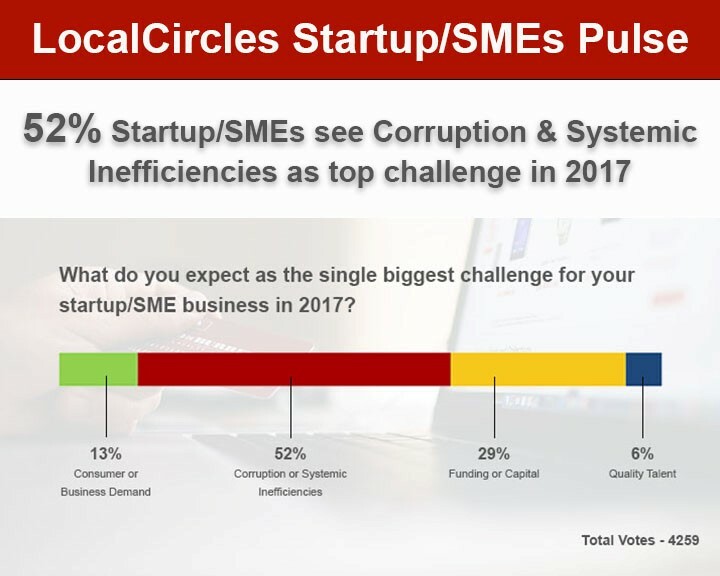 52% Startups/SMEs see corruption and inefficiencies as the biggest challenge for their business and 58% want Government to facilitate reduction in state and local bottlenecks faced on the ground.